The M38A1 military Jeep has a strong Canadian connection. Over 1,000 of the original A1's were built by Ford in Canada in 1953 for delivery to the Canadian military, and designated M38A1 CDN. By 1967 the Canadian Forces were still happy enough with their A1's to order 800 more (referred to as M38A1 CDN2) from the Kaiser Jeep plant in Windsor, Ontario. These have gone on to become a symbol of Canada around the world, painted white for their role in United Nations peacekeeping operations. In 1999, for my second Tonka refurbishing project, I decided to turn a damaged toy CJ-5 into a model of the Canadian M38A1, dressed for its deployment in UN peacekeeping. The Tonka toy that I started with had the windshield and steering wheel completely broken off and missing. I decided to turn this problem into an opportunity, and install replacements more accurate to the M38A1. The rest of the toy was in very good shape -- little rust, and no other damage to the plastic chassis as I had found on my earlier fire Jeep conversion. 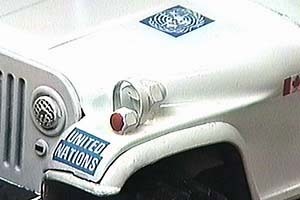 Features added to the model included blackout and marker lamps made from acorn nuts, a whip antenna, and a UN flag on a wooden stick. The flag and the other graphics were downloaded from the web, printed on paper and glued to the model with contact cement. The spare tire, from some long-forgotten toy truck, looks pretty close to the prototype's military tires. Needless to say, the big Tonka wheels and tires are not prototypical, but with the white hubs they don't look too bad. The most difficult part of the project (aside from when the white Tremclad spray can got punctured) was cutting and fitting the windshield where the old one had been torn off. The replacement was cut from a piece of plastic out of an old refrigerator, and attached with pins inserted into drilled holes in each side. The divider in the middle of the two-pane military windshield is a finishing nail. The damaged dashboard side of the windshield base was patched with epoxy and filed flat, which is prototypically correct. The steering wheel is a Meccano part courtesy of my father. It has four spokes instead of three, but is a better size than the missing Tonka part. 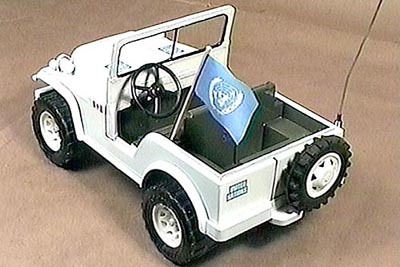 The prototype photos on which I based the model, showed Jeeps in use on the Mediterranean island of Cyprus. 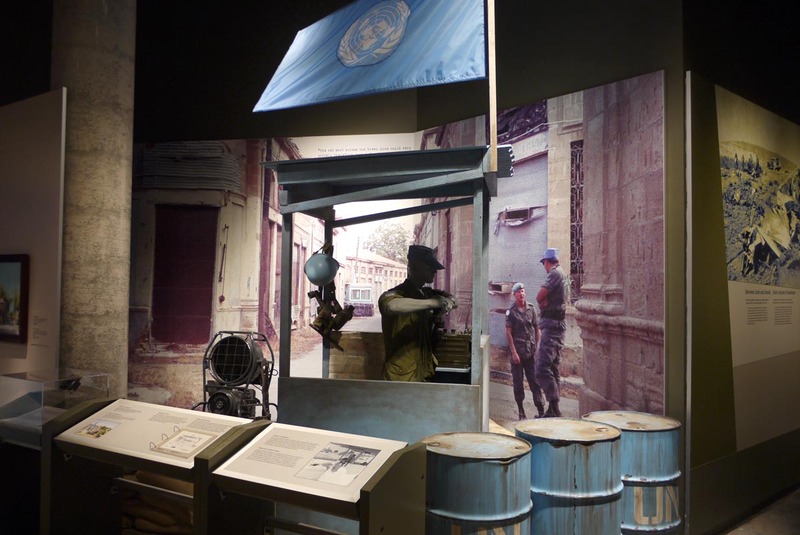 The Canadian War Museum in Ottawa has a UN peacekeeping diorama (140K JPEG) which resembles the location of this photo. 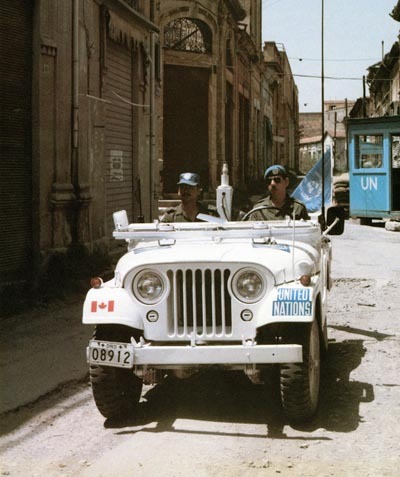 The UN forces in Cyprus (UNFICYP), patrolling to prevent conflict between the Greek and Turkish populations on the island, have included a significant Canadian contingent since 1964. 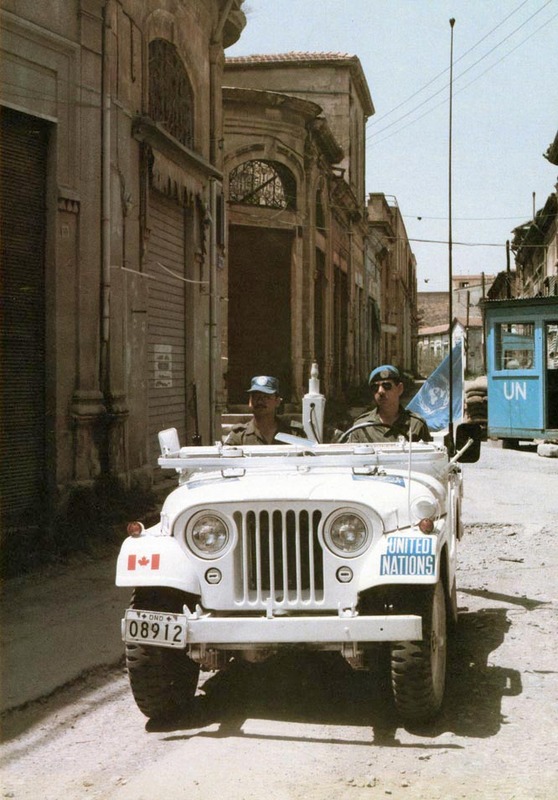 For the first ten years, the Jeeps were olive drab, but after the Turkish Invasion of Cyprus in 1974 they were painted white. The year 2014 is the 50th anniversary of UNFICYP. Given that the Tonka CJ-5 is limited in its accuracy as a scale model to start with, I decided that I wouldn't try to be 100% accurate in this conversion to the M38A1. Some of the features of the prototype that I decided to live without, included recessed headlights, lifting rings on the bumpers, rear view mirrors, top-mounted wipers, 24V electrical connector on the right side, dual battery box on the cowl, and blackout taillights. But there's enough detail to give the model the look of this distinctive Canadian Jeep. 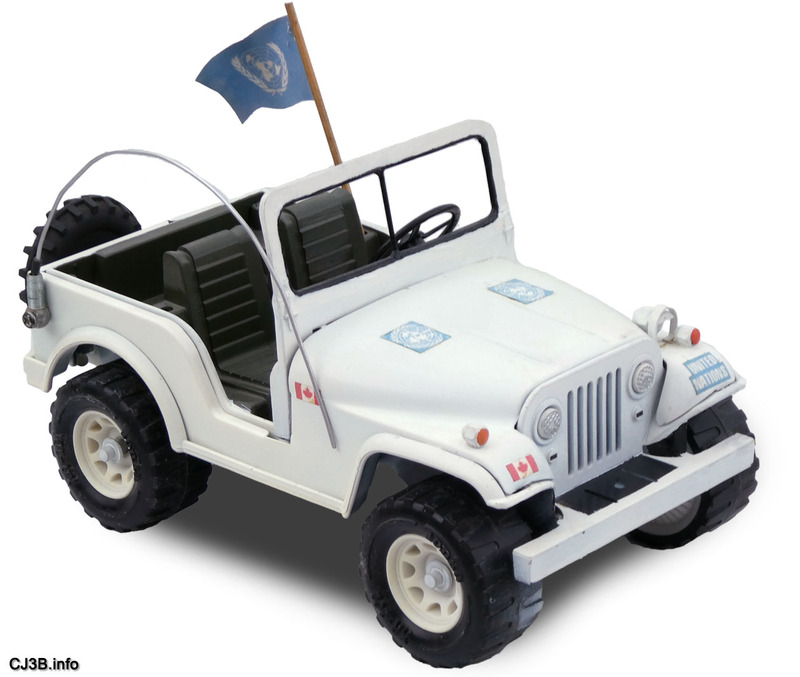 Also on CJ3B.info, see Tiny Jeep Honors 50 Years of UN Forces in Cyprus. For lots more Tonka Jeeps, return to the Toy Jeeps Pages on CJ3B.info.